Planning for your special needs child or for your loved one with a disability can be challenging. The first step in planning, though, is to remember that “disability” is the Social Security Administration’s term for describing an individual’s ability to work. It is not a label we use to assess an individual’s value or worth. With that in mind, we must determine what the individual we are planning for can do for himself or herself. Our planning focuses on helping that individual reach farther to achieve more. Prior to age 18, parents are the natural guardian of their child. As a child approaches his or her 18th birthday, the first challenge is evaluating your child’s needs and abilities. Can your child make his or her own decisions? If so, then your role is supportive. If not, then you should consider filing a guardianship petition. In Georgia, a guardianship petition can be filed up to six months prior to the child’s eighteenth birthday. A guardianship or conservatorship is not something you should leap to as a knee-jerk reaction. It is a tool used when your child lacks legal capacity to make decisions. The primary issue a court would consider is whether your child can make or communicate significant decisions regarding his or her person and his or her finances – not whether you agree with the decisions. Can your child work? The Social Security Administration defines “disability” as the inability to engage in substantial gainful activity (a defined term). This does not mean unable to work “at all” – but if your child is unable to work and earn enough to meet the Social Security Administration’s definition of substantial gainful activity, then we need to consider an application for Social Security disability benefits or Supplemental Security Income. An adult disabled before age 22 may be eligible for Disability income as a “child's benefit” if a parent is deceased or starts receiving retirement or disability benefits. Otherwise, we will be planning for Supplemental Security Income, which is a means-tested program. Health care providers may or may not continue sharing information with you after your child is 18. The Health Insurance Portability and Accountability Act (HIPAA) includes privacy rules, but health care providers may share information with a health care decision-maker or with someone who holds a HIPAA release. If you are appointed as your child’s guardian, then you are a decision-maker and you can access health information. If you are not a guardian, then consider whether your child can execute a health care advance directive that appoints you as health surrogate, or whether your child can execute a HIPAA release. If your child continues receiving services from the school system after turning 18, the school might begin speaking with your child and leaving you out of the loop. If you are the guardian, they cannot stop talking to you because you are the decision-maker. If you are not your child’s guardian, then you need to speak with your child and let him or her know you still want to be part of the conversation. Consider whether a special needs trust will help your child qualify for public benefits like Supplemental Security Income or Medicaid. Your child can place his or her own assets inside a self-settled special needs trust, but other individuals like parents or grandparents can provide even greater protection by placing assets the child will inherit inside a third party supplemental needs trust. Ask a lawyer about special needs trust or a supplemental needs trust because these can be complicated and if you don’t set them up right, your child might not get public benefits. 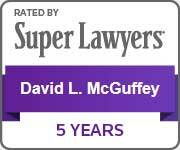 David L. McGuffey is a member of the Special Needs Alliance and has helped hundreds of families plan for the future of their special needs child or special needs loved one. Call us today if you need peace of mind planning for your loved one.